Click here to RSVP and pay for this meeting by Friday, December 4. You love your craft beers and brands. Serving and meeting the needs of customers is priority #1. Product relevance is paramount. People and beer drive the success of breweries. Branding supports an ever-changing relevance factor. Join us December 7th to hear from John Bryant and Mark Irvin the story of Spokane’s home town brewery, No-Li Brewhouse. 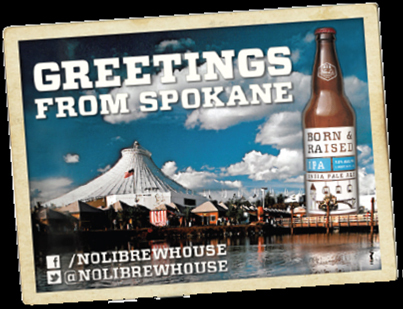 With 25 years of experience apiece, John and Mark created a partnership to help build Spokane’s craft beer culture. Come prepared with your branding questions for an extended Q&A session during this event! When it comes to marketing, what are you broadcasting? What's the overwhelming signal you give off whether you're leading a project, networking at an event, posting on Facebook or being interviewed on camera? Join us for our February Development Workshop "What Are You Broadcasting?" featuring six-time EMMY® winner Shawne Duperon. Shawne has trained thousands across the globe and will show you how to avoid classic on-camera mistakes that harm your brand. Learn more about this event and register today! You may have noticed in November that our monthly meeting survey has received quite a facelift. It certainly helps to have a skilled market research practitioner on the board! Survey Monkey is an easy, effective and economical polling tool, and once Joanne Vega improved our questions and format, it has become all the more useful for us to listen to you and improve events for our attendees. There is always a tradeoff between accurate survey responses and shorter surveys. Introductory filter questions increase survey length and can scare off some responders; but they help to “bucket” and analyze each responder, to weed out those responders just filling in the bubbles, and give the responder a warm-up period to build confidence and share information more freely. Avoid “check all that apply” questions, which portray nothing of specific preferences. Rather, ask responders to fill in specifics, such as how much of each product/medium are used/viewed/consumed. Be wary of ambiguous terms, such as rarely, frequently or regularly. These words have different meaning for each responder, thus adding more bias to each completed survey. We strive for all MarCom events, such as our latest Cocktails & Conversations with Strategic Research Associates, to shed new light on current trends and to give starting points and takeaways for honing our various skills in the marketing, communications and public relations professions. And I’ll look forward to reading your opinions regarding this subject and others in our event surveys! It may be hard to believe, even blasphemous to many reading this article, but a perception still exists that public relations is only a tool to spin or cover something up. This bit of cynicism may sound like a sentiment out of the late eighties (or 1800’s), but just recently this attitude was in evidence in our own backyard. Oftentimes, we as communications professionals are so entrenched in our work—in seeing public relations enhance public awareness and drive business goals, in helping an organization besieged by crisis emerge stronger and more credible after authentic dialogue with audiences—that we forget a lingering distrust and misunderstanding of our industry exits. This mentality is held by a wider margin of the public than you might expect. After all, only 11% of the US public believes public relations is a valuable profession. On top of that, a staggering 60% of the public distrusts information from the media, and only 17% trust messages straight from organizations. After an election season when the truth became something as moldable as play dough, it’s not difficult to understand the frustration. Thankfully, the service we provide does in fact make an invaluable impact, and plenty of organizations know it. We have been blessed to work with clients across every industry you can imagine who have benefited from stronger trust and credibility with their audiences and larger market shares, due in large part to improved communications. The good news is, as public relations professionals we’re equipped with the skills to help overcome negative and misinformed perceptions. The opportunity rests with us to educate audiences on the merit of our industry by showing results and demonstrating value when we report on our work. That means having measurable objectives like percent of market share, number of consumers reached, and media results, built into our projects and campaigns from the beginning. Public relations isn’t about spinning anything, it’s about authentic and consistent communication. Often, it’s the communications professionals who make the case in organizations to share more information and create more dialogue. That is how we’re wired. PR recognizes there are different groups of people, different audiences, who consume information in different ways. It’s the job of good PR to meet them where they’re at and facilitate a dialogue between those groups and the individuals or organizations initiating the message. That dialogue provides feedback to make sure products and services are improved, that ideas are refined. It creates and improves relationships between individuals and ideals. It’s the way by which reputations are established and maintained. And we’re proud to be a part of an industry where so many talented people contribute to organizational success everyday! Shriners Hospitals for Children® is one of the largest pediatric sub-specialty health care systems in the world. With locations in the U.S., Canada and Mexico, the Spokane Shriners Hospital is a one of 22 hospitals dedicated to improving the lives of children by providing pediatric specialty care, innovative research and outstanding teaching programs for medical professionals. Shriners Hospitals for Children — Spokane has been providing expert pediatric specialty care for kids from birth to age eighteen with orthopaedic conditions since 1924. The types of conditions treated vary from serious orthopaedic issues requiring multiple surgeries to fractures or sports injuries easily corrected with one surgery. The Spokane Shriners Hospital cares for kids from Washington, North Idaho, Montana, Alaska, Canada and Mexico in a compassionate, family centered environment. Acceptance is based solely on a child’s medical needs and all care and services are provided regardless of the families’ ability to pay.